Micromax has launched an affordable 7-inch tablet called the Canvas Tab P470 available in mystic grey and classic silver color variants. The dual-SIM supporting Micromax Canvas Tab P470 features a 7-inch TFT display with 1024x600 pixel resolution. 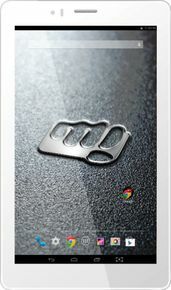 Micromax Canvas P470 Tablet price in India is around 7K. Buy this tablet at best price if you are looking for a pocket friendly device. Experience the world of Android come alive on the Canvas Tab P470 with the KitKat 4.4.2 Operating System. Buy Micromax Canvas P470 Tablet online that is powered by a dual-core MediaTek MT8312 processor clocked at 1.3GHz, coupled with 1GB of RAM that boosts the processing power of this tablet giving you smooth functioning throughout. Micromax P470 has a brilliant 5 megapixel rear camera which produces amazing photographs. It enables you to capture beautiful shots in almost all lighting conditions easily. The front 0.3 megapixel can be used to make video calls as well. Micromax P470 tablet provides superior graphic quality and awe-aspiring clarity. Micromax P470 Tablet specification includes 8 GB of inbuilt storage, which can be expanded via a microSD card up to 32 GB. It is 3G compatible and comes with dual sim card slot. You can seamlessly access internet application on this device using Wi-Fi connectivity as well. It is Bluetooth enabled which makes it easier to share multi-media data with nearby devices. The Canvas Tab P470 also features support for 21 Indian languages, including Hindi, Gujarati, Punjabi, Malayalam, Tamil, and Kannada. In addition to this you can also play 3D games, watch videos, listen to music, and create documents and a do a lot more on this device. Micromax Canvas P470 comes with a powerful 3200 mAh battery. It gives you up to 11 hours of talk time, 3.5 hours of internet usage, 6 hours of video playback and 158 hours of standby time. Buy Micromax Canvas P470 Tablet online at lowest price by comparing its price from different online stores like Snapdeal, Amazon, Flipkart, Infibeam etc., get the best price deal and make this yours. Please don't invest your money on this pathetic piece of SHITTTTTTT !!! !